Whether you’re contemplating a career in the franchise industry, or if you’re an established franchisor, progression should be a prime consideration. But how can you grow your franchise? 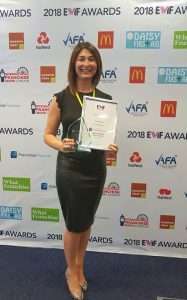 We spoke to Fiona Simpson, ‘Woman Franchisor of the Year’, about her business’s growth, and her advice for aspiring franchisors. 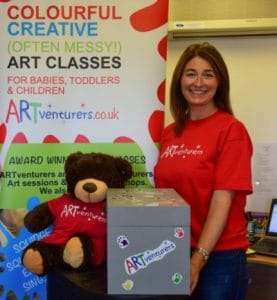 Fiona is the Founder, Franchisor, and Managing Director at ARTventurers. But what made her decide to franchise ARTventurers in the first place, and how has she found that process? “My franchisor journey has been a steep learning curve,” Fiona acknowledged. “I did initially look at alternative models of expansion, including opening branches with employed staff. However, the franchise model is one that works well in the children’s activity industry; and there were already some great examples of brands who’d successfully franchised. “I was keen to test the market before investing in a franchise model. So, I licensed for a year to ensure that it was workable before I invested the money to employ a consultant, and launch it as a full franchise opportunity. “There have been lots of challenges along the way, both on a personal and professional level,” said Fiona. “With two young children, it’s been a constant juggling act between home and business, which is always a challenge for any working parent. However, I’m very lucky to have a strong support network of family and friends. Creative play classes for babies, toddlers and children! ARTventurers are a national franchise network. They run events, parties and creative art & play classes for babies, toddlers and young children across the UK. 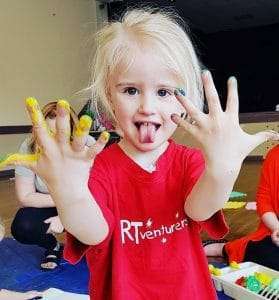 Initially inspired by Fiona’s two children, Erin and Isaac, ARTventurers was set up in Sunderland in 2011, starting with just a couple of classes per week. As demand grew, Fiona expanded the business through licensing, before developing a franchise model back in 2015. The company now has over 30 branches, with a network of franchisees running family friendly, award-winning businesses. The business won ‘Best Pre School Activity’ 2017 and 2018 in the What’s On 4 Kids Awards. The company was also crowned ‘Overall Top Franchise’ in the Working Mums Top Franchise Awards. “From a business perspective, one of the biggest challenges for me has been developing a workable franchise model. I needed something structured enough to protect the ARTventurers brand, but flexible enough to attract the right type of franchisee. Fiona puts ARTventurers’ success down to ‘supporting’ and ‘investing in’ her franchise team, at ‘every stage of their journey’. ARTventurers now has over 30 branches, with plans to launch another 10 in the next few months. And Fiona believes anyone can cut out a career in the franchise industry. Fiona is a highly successful female franchisor, but what’s her message for other women in the franchise industry? “My main message to women in business – franchisors or otherwise – would be to reach out to others. I’m a firm believer in networking and collaboration. Starting a new business can be both stressful and, at times, isolating. It’s really important to connect with other people who are going through – or have gone through – the same journey. There are plenty of brilliant networking groups and events out there, from franchise specific ones like EWIF to more general business networks. It’s just about trying a few and seeing which ones sit well with you and your business. Are your franchisees pulling in different directions, following different advice from different accountants? A divided franchise is an unproductive franchise. That lack of consistency can damage your profits and hinder your business’s opportunity for growth. Your franchisees need to be working towards a common goal, with a service provider who can handle the demands of a national network. By partnering with Danbro, you can better support your franchisees, and fast-track your franchise. We’ll understand, we’ll deliver and, ultimately, we’ll grow together. Click here to find out more.